Seien-ryu is the lineage based in Nagoya which carries the original honkyoku of Fudaiji temple, as well as an extensive gaikyoku repertoire. This lineage is the source of many of the most popular of today's honkyoku. In August of this year (2009) the 5th iemoto of Seien-ryu, Obara Seien, passed away. Before he died he had consulted with the other senior Seien-ryu members, and had agreed upon the choice of Iwata Ritsuen as the next iemoto. Iwata Ritsuen studied from two of the 2nd iemoto's students, and also from his father who was the most senior student of the 4th iemoto, Kobayashi Seien, and had studied all of the honkyoku directly from the 3rd iemoto Katou Seien. As well as being a master of Seien-ryu, Iwata Ritsuen studied directly from Tanikita Muchiku is regarded by many as the greatest living Myoan Taizan-ryu player. Iwata Ritsuen is now Iwata Seien, the 6th Seien-ryu iemoto. Interesting News - Thanks Justin. If anyone hasn't already heard these pieces, traditional and some great new duets they are great. Justin have you studied with this guy? Yes that is him. There he is playing Taizan-ryu (also known as Taizan-ha, Myoan etc) style. Yes he is one of my teachers. I really wanted to learn the original Fudaiji pieces from Seien-ryu, and was recommended Iwata-sensei as the best player and also having the most pure Seien-ryu style (although he can also play the Taizan style excellently). Studying from him has been a real joy as he is a great teacher (quite renowned for his strictness!) as well as a great player, and his instruments (old Seien-ryu instruments) are excellant. He has also studied with Uramoto Setcho and so has some other pieces in his repertoire.
. and his instruments (old Seien-ryu instruments) are excellant. 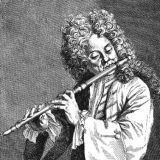 What are the characteristics of these instruments, are they different in any way to other Myoan flutes? I wonder if I have any in my collection. Hi again Justin, I've been wondering when you said "There he is playing Taizan-ryu " are the sound files of him playing Taizan-ryu? What are the differences in Taizan- ryu and the Seien-ryu in terms of playing? You said on your website that "He arranged the Fudaiji pieces into new versions (making changes in structure, pitch and ornamentation) and included them as the basis for his school's repertoire" I was just wondering if there's any way to describe in what ways? One characteristic is the pitch. As you may have heard me and many other players from Yokoyama Katsuya's school saying, many instruments cannot play Yokoyama's honkyoku in tune, which includes the Edo period shakuhachi and indeed many of the modern ones not designed to play Yokoyama's honkyoku. A question then often raised is, but if they are Edo period honkyoku, is it not absurd to say they cannot be played on Edo period shakuhachi? I think the answer to this is that obviously in Yokoyama's school we play them in a modern way. That is not to say there are only two ways, old and modern, but perhaps a continually shifting "modern", snapshots of which become "old". I'll talk more about the stages of change in the honkyoku in my next post. Anyway here at least I'll say that not just in Yokoyama's school but also the playing of most honkyoku schools these days seem to use modern tuned shakuhachi, and so this tuning becomes an integral part of the repertoire (e.g. Jin Nyodo's school, Mitsuhashi Kifu's school, Chikuho-ryu, etc etc.) Even many players of other schools such as Taizan-ha and Tani-ha will have instruments with high pitched "chi" for example but try their best to make it as flat as possible, both in making and in playing. Iwata Ritsuen on the other hand fully utilizes the tuning of his instruments. His main ones were made by a disciple of Gyokudo Baizan (Fudaiji komuso). They are near to Kinko style (Fudaiji was a branch monastery of Ichigetsuji) although there are some differences. The earliest have no ji, later ones (seem to be around the time of Araki Chikuo and after) some ji. Utaguchi also slightly different from Kinko - I may put some pictures on my website when I get time. Standard length is 1.9. Iwata-sensei is quite strict about instruments. He says the Seien honkyoku should be played on Seien-ryu instruments. That's not to say he forbids otherwise or anything like that. But he says even shakuhachi from Kyoto (which is quite nearby) of the same period are not as suitable as Seien-ryu style. I came to study first with a 1.9 I had made and the (modern) tuning made it totally unusable for this repertoire! I was actually exhilarated, as finally I could learn honkyoku in Edo period tuning! 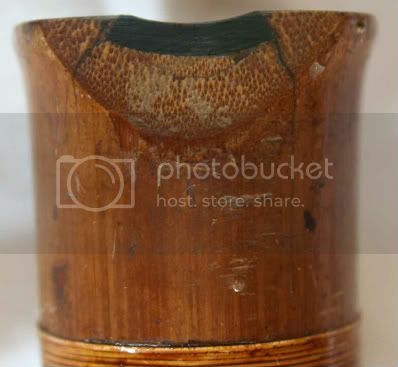 So from then on until making my own Seien-ryu shakuhachi I used a particularly fine Edo period 2.0 which though from Gunma and coming from a different temple, was near in style. Hi again Justin, I've been wondering when you said "There he is playing Taizan-ryu " are the sound files of him playing Taizan-ryu? What are the differences in Taizan- ryu and the Seien-ryu in terms of playing? You said on your website that "He arranged the Fudaiji pieces into new versions (making changes in structure, pitch and ornamentation) and included them as the basis for his school's repertoire" I was just wondering if there's any way to describe in what ways? Taizan did this in a number of ways. One of the most striking is that on repeating a note, one generally does a "yuri" after the repetition. This was Taizan's addition. Another is the pitch. Some of you may already know that Taizan-ryu generally don't use tsu meri, but instead use tsu chu meri (although the notation is written as tsu chu meri). There "u" is also "sharp" by the standard of other schools. In Seien-ryu meri is deep, i.e. the pitch is flat, as it is in Kinko-ryu. So this is another of the changes Taizan made. [Miyagawa Nyozan is one who did use tsu meri, so this either shows flexibility in Taizan as a teacher, or Nyozan as a student]. Taizan first went to Kyoto with the aim of teaching gaikyoku (ensemble music), which is also a strong tradition in Seien-ryu. His gaikyoku didn't make the success he wanted but his honkyoku did become popular, so later he taught only honkyoku. As I mentioned he actually basically took over from the native Kyoto honkyoku tradition, Shimpo-ryu, which survived only in part from the pieces Sakai Chikuho adapted into his repertoire, and the pieces which survived from individuals such as Yamaue Getsuzan. Anyway why I mention Taizan's gaikyoku is because the people in Nagoya noticed how adaptable Taizan was to style - in Kyoto he played gaikyoku in Kyoto style, and returning to Nagoya he had no trouble to play in Nagoya style. For me this adds to the picture of his changing the pitch. My studies of Shimpo-ryu are not advanced, but I am suspecting he may have adapted the Seien-ryu honkyoku to suit the ears of the Shimpo-ryu population. (One should also note that he studied under the head of Shimpo-ryu, Ozaki Shinryo). Interestingly in many schools today the meri pitches have reverted to their lower state, and even bringing with them some regular "tsu"s down to tsu meri, and other pitch changes. Subtler changes in nuance are too difficult to write but these 2 are the most significant changes. Changes in structure include changing the order of otsu and kan parts in Kyorei, rearranging Tsuru no Sugomori, leaving out the last half of Koku, lengthening Shizu, and so on, as well as changing the names of some of the pieces. He also studied Kinko-ryu from Araki Chikuo and included pieces such as Hifumi, Hachigaeshi and Shika no Tone in his repertoire but these were also drastically changed as can be seen by listening to the Kinko-ryu and Taizan-ryu versions, or even comparing Taizan and Chikuo's notation. I don't have clear information of the history of the other pieces in his repertoire yet, but would love to hear more about it. I wanted to email you but you have no email link here on the forum, and I couldn't find one on your website either. You have a page on your website entitled "Iwata Seien- Seien-ryu sound files". Although it is indeed Iwata Seien, they are not actually Seien-ryu sound files. There he is playing Taizan-ryu style, which he also studied, under Higuchi Taizan's student Tanikita Muchiku. Hi Justin, Thanks allot for pointing that out, I forgot to go back and change that, and added the email while I was at it. Last night I had the pleasure of going to see Iwata Akihiko, Iwata Seien's son and his band play a jazz concert here in Nagoya. One of my colleagues from work is a close friend of the Iwata family and I was very lucky to be introduced to Akihiko. We had a good chat about shakuhachi, and he told me that a chap from England had been studying with his father, and that turned out to be you Justin! Such a small world. Just thought I'd let you know that they spoke very highly of you! The concert was amazing too, I've seen some "shakuhachi jazz" on the internet but nothing like this. The band's called WAZZ, I presume a combination of 和　and Jazz (despite having a less than polite meaning in english slang!). I managed to get a bit of a video, when I have time I'll upload it and put a link on here. They seem to be a very talented family, I'm looking forward to meeting them again in the future. Yes, a very talented family! Both of Iwata's son are great shakuhachi players. Last time I was there Akihiko and his brother 岩田恭彦 (shame on me I have forgotten how to pronounce his name) played a duet together that was great. His brother has made some very impressive compositions also. Now that both flutes of Seien-ryu and Ozaki Shinryu have been mentioned. A few pictures of Ozaki Shinryu's shakuhachi. Thanks for the pictures. 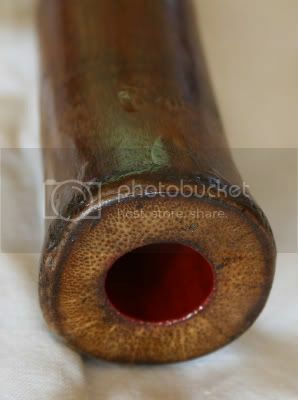 When you say "Ozaki Shinryu's shakuhachi", do you mean this was Ozaki Shinryo's main shakuhachi which he played? Is that by chance in Shimura's museum? Would be very interesting to see. 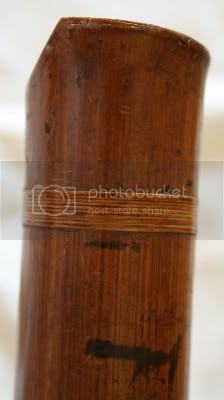 When you say "Ozaki Shinryu's shakuhachi", do you mean this was Ozaki Shinryo's main shakuhachi which he played? Is that by chance in Shimura's museum? Would be very interesting to see. I was told it was his main flute but who knows... It had also cracked badly and been repaired crudely. It is - unfortunately - in a private collection. It is a shame when such repairs are done. I have seen some of the finest and historically important instruments with unsightly and damaging amateur repairs done to them. Well, at least it is still existing. 1.8 I presume? Justin, why don't you track this flute down and volunteer to undo these bogus repairs and restore it? That would be good karma. I could be possible, but I would also need to get my hands on at least one, preferably two shakuhachi made by the same maker for close inspection. I had a similar job for a shakuhachi made by Kokyo, an esteemed Edo period maker, which had had the face of the utaguchi filed down somewhat, utterly changing the tone and the angle too as the filing wasn't even straight. Luckily I am more familiar with that maker and was able to restore it the Kokyo's usual style. Kiku if you wish you are welcome to contact me offlist about it.